Place a skillet over a medium-high heat. Baste corn cob with 1 Tbsp of the olive oil and add to skillet, turning until charred and caramelised, approximately 5-6 minutes. Cut corn kernels from the cob and set aside. Meanwhile, heat remaining oil in a deep non-stick frypan over a medium heat. Add onion, garlic and jalapenos. Stir continuously to avoid colouring and cook until the onions are translucent, approximately 2-3 minutes. Add rice and cook to toast for a further 2 minutes. Pour in stock and crushed tomatoes, add the spices and a generous pinch of salt and pepper, stir through and bring to a boil. Reduce heat to low and cover with a lid or aluminium foil, simmer for 10-15 minutes or until the rice is cooked through. Add the corn kernels and combine well. 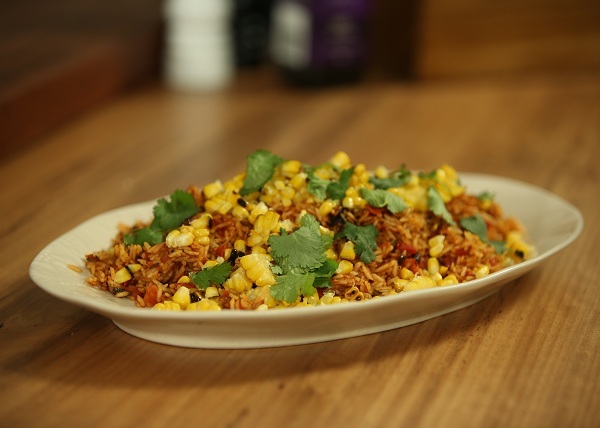 Divide rice into serving bowls, garnish with fresh coriander leaves and a squeeze of lime.